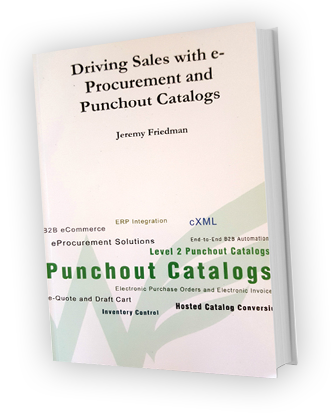 Punchout Catalogs are a great tool for institutional buyers for ease of use in shopping, but how do you achieve full order automation when a Punchout Catalog simply allows shopping, but not payment? The answer is electronic purchase orders. After a user creates a requisition in the e-Procurement system the order awaits approval before a Purchase Order is issued. Once that Purchase Order is issued (depending on your customer of course) it can be sent via email, PDF, EDI, XML or cXML. Why use cXML Purchase Orders? When your customer issues a PO via cXML they know the order is received. There is an electronic handshake that occurs between the e-Procurement system and your cXML Order Processing system. The e-Procurement system makes the request saying I’d like to delivery PO # 12345, do you accept this order? Your order processing system must process the response and return a “Yes” or “No” to indicate whether the order is accepted. If a “Yes” is returned the e-Procurement system will mark the order as accepted and assume it is being processed. If a “No” is returned, the e-Procurement system will usually try to resend the request and then move it to the failure queue so the support team at the e-Procurement company can investigate the issue. If your organization uses our Punchout Catalog platform all orders can flow into our centralized order processing system. If you’d like to setup a demo or just ask questions about how cXML Purchase Orders work, call 1-877-415-3237 or submit your information on the form to the right.